Though purple lipstick might be trendy, having lips that naturally look blue, purple, or grayish can be a severe health problem. 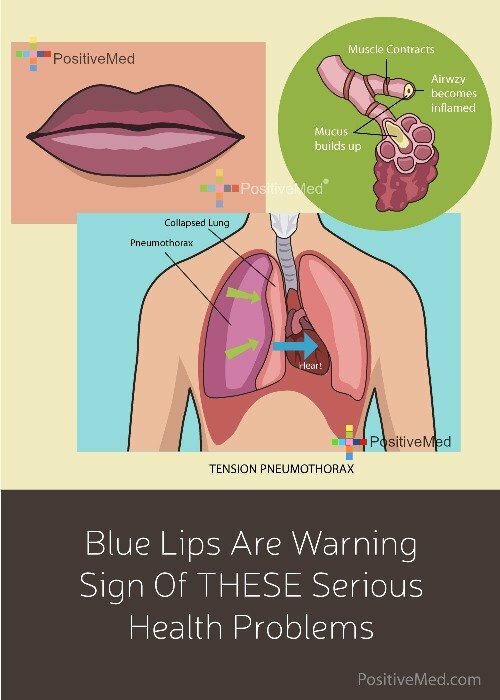 Blue lips are usually a sign that oxygen levels in the blood are low or blood circulation is poor. Cyanosis is the medical name for having a blue tint is cyanosis, and it can affect the lips, gums, and even hands or feet. People with blue lips are most likely having trouble getting enough oxygen. Blue lips are often a warning sign for these three conditions. When cyanosis appears in the lips instead of the limbs, it is most often due to a problem with the lungs. Chronic Obstructive Pulmonary Disease (COPD) is a disease that gradually makes it harder and harder to breathe. Instead of functioning properly, the airways of the lungs are thick, inflamed, and coated in mucus, making it hard for the air sacs of the lungs to get oxygen to the blood. When oxygen levels are extremely low, COPD can cause the lips and fingernails to look blue or grayish. This is a sign that the COPD has progressed to a very severe stage. 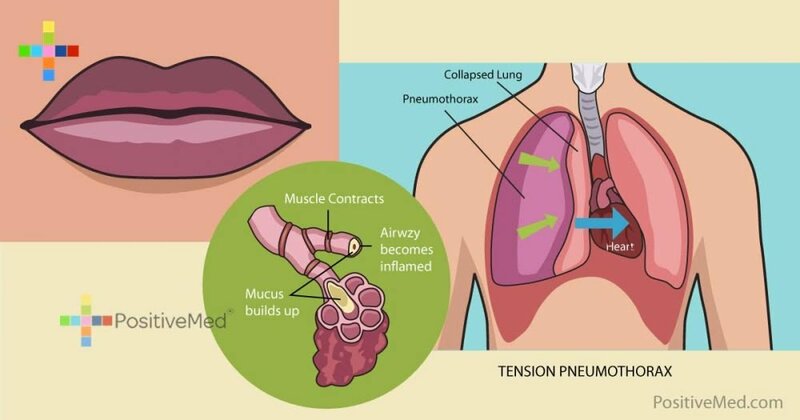 Pneumonia occurs when the lungs fill up with liquid instead of air. This infection makes it difficult for the lungs to properly oxygenate the blood. If a person has pneumonia, they may not be aware of it, since it can mimic a mild cold. However, if the difficulty breathing occurs along with blue lips, then this is a sign that the lungs are having difficulty functioning. Congestive heart failure occurs when the heart cannot properly pump blood. Most people are aware of the signs and symptoms of severe heart failure, but it is actually a chronic disease that slowly worsens. When it first begins, symptoms may not be noticeable for years, but the heart can be gradually losing its ability to pump blood. One of the first signs of heart failure is actually blue lips, since the body will deal with the limited circulation by diverting blood away from nonessential areas. If you notice that you or someone else has blue lips, it is necessary to consider a few things. First, it is extremely important to make sure the person with blue lips can breathe and is not suffering from any other severe symptoms, such as convulsions or chest pain. A sudden change in lip color can be due to choking or respiratory failure, and prompt emergency medical attention will be necessary. 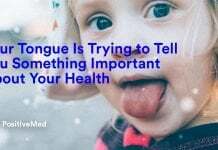 If no other medical symptoms besides blue lips have occurred, check to see if you have been at a high altitude or in a very cold area previously. If you have blue lips for just a short time after being at a high altitude or cold temperature, and the blue lips quickly disappear, then the cyanosis was probably just due to a temporary lack of oxygen and circulation. However, if your lips are consistently blue, it is necessary to seek medical attention. 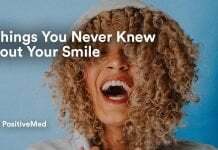 Blue lips can be a warning sign for many different health problems, and catching a medical issue while it is still developing makes it easier to treat the problem. A doctor can diagnose an underlying condition or disease that is causing cyanosis and help you to treat it.